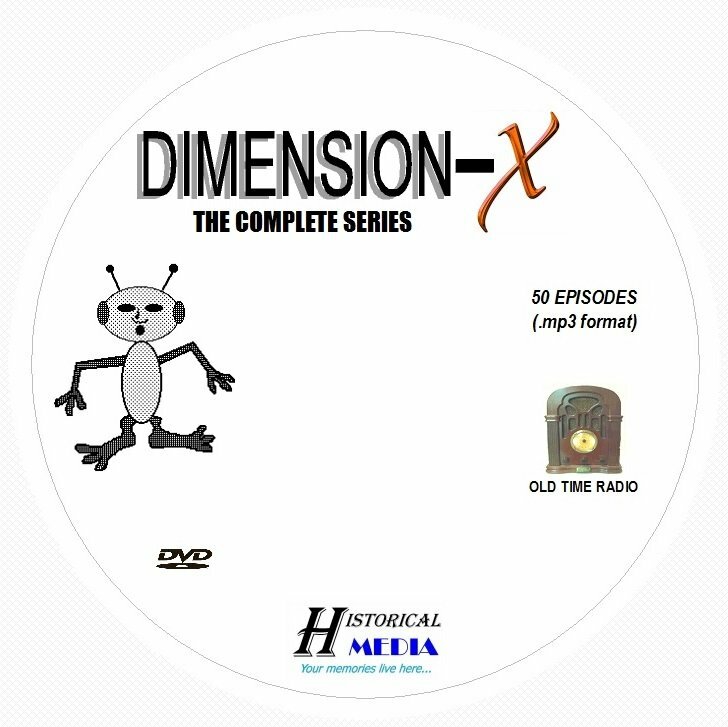 This collection of "Dimension-X" radio programs features 50 shows on 1 DVD. Each episode is presented in the .mp3 format. There are close to 25 hours of entertaining and thrilling "Dimension-X" episodes. The DVD is labeled and provided in a highly protective jewel case. A list of the programs on the disc as well as the date the program originally aired (if known) is also provided. PLEASE MAKE SURE YOUR EQUIPMENT WILL PLAY MP3 FORMATTED FILES BEFORE PURCHASING THIS ITEM. IT IS ULTIMATELY THE RESPONSIBILITY OF THE BUYER TO ENSURE THAT HIS OR HER EQUIPMENT IS COMPATIBLE WITH THE MP3 FORMAT. A note concerning sound quality. The sound quality for the shows in this collection is very good to good. It is difficult to find perfect recordings from the golden age of radio due to the equipment used for recording and the fact that many of the recordings were made 60, 70 or even 80 years ago. "Dimension X" was an NBC radio program broadcast on an unsponsored, sustaining basis from April 8, 1950 to September 29, 1951. The first 13 episodes were broadcast live, and the remainder were pre-recorded. Fred Wiehe and Edward King were the directors, and Norman Rose was heard as both announcer and narrator. Preceded by Mutual's "2000 Plus" (1950-52), "Dimension X" was not the first adult science fiction series on radio, but the acquisition of previously published stories immediately gave it a strong standing with the science fiction community, as did the choice of well established, respected writers in the field: Isaac Asimov, Robert Bloch, Ray Bradbury, Fredric Brown, Robert A. Heinlein, Murray Leinster, H. Beam Piper, Frank M. Robinson, Clifford D. Simak, William Tenn, Jack Vance, Kurt Vonnegut, Jack Williamson and Donald A. Wollheim. Ernest Kinoy and George Lefferts adapted most of the stories and also provided original scripts. It was not until the 1950s that science fiction radio really hit its stride, even as science fiction was beginning to appear on television as well. Radio programs such as Mutual's "2000 Plus" and NBC's "Dimension X" were anthology series that offered a variety of exciting tales of future technology, with a special focus on space exploration (including alien invasion), though both series also often reflected contemporary anxieties about the dangers of technology. The series opened with "The Outer Limit," an Ernest Kinoy adaptation of Graham Doar's short story from The Saturday Evening Post (December 24, 1949 issue), about alien contact. A week later (April 15, 1950), the program presented Jack Williamson's most famous story, "With Folded Hands," first published in the July 1947 issue of Astounding Science Fiction. "Dimension-X" was one of the first shows to be recorded on tape. This was so new that one show, "Mars is Heaven", had to be re-recorded three times because the engineer kept erasing the tape while editing it. With a five-month hiatus from January 1951 to June 1951, the series spanned 17 months. Later, NBC's "X- Minus One" (1955-58) utilized many of the same actors and scripts.